Also serving communities of Austinburg, Conneaut. There are 5 Assisted Living Facilities in the Ashtabula area, with 3 in Ashtabula and 2 nearby. The average cost of assisted living in Ashtabula is $3,627 per month. This is higher than the national median of $3,346. To help you with your search, browse the 10 reviews below for assisted living facilities in Ashtabula. On average, consumers rate assisted living in Ashtabula 3.2 out of 5 stars. Better rated regions include Painesville with an average rating of 4.6 out of 5 stars. Caring.com has helped thousands of families find high-quality senior care. To speak with one of our Family Advisors about assisted living options and costs in Ashtabula, call (855) 863-8283. Ashtabula, Ohio gets its name—which means “always enough fish to be shared around”—from its location on the Ashtabula River and Lake Erie. Located in the northeast corner of the state, the city is home to 18,371 residents. About 29 percent of those are at or older than age 55 and at some point may need the services provided in an assisted living community. Four of the seven assisted living facilities (ALFs) serving this community are located in the neighboring cities of Austinburg, Madison, Conneaut and Geneva. The Ohio Department of Health serves as the regulatory agency for licensing and inspection. Seniors who love snow will find no shortage of it in Ashtabula, as the city gets more than seven feet of it every year on average. While temperatures don’t dip quite as low as they do in other snow-rich regions, bottoming at around 20 Fahrenheit, the Sperling’s Comfort Index rank is still lower than average. Housing in Ashtabula is a steal at just 27 percent of the national average, bringing the overall cost of living down to 74.5 percent of the national average. The only area exceeding the national average is transportation, and even that’s higher by just 2 percent. That puts more money in the pockets of seniors, who often have more limited funds available to spend. The cheaper cost of living in Ashtabula might come with a higher cost of safety for seniors. Violent crime and property crime rates exceed the national averages by 50.6 and 42.6 percent, respectively. Seniors will find plenty of entertainment in venues in Ashtabula such as Walnut Beach, music in Cornelius Park, wineries, the Ashtabula Mall, Hubbard House, Ashtabula Maritime Museum and antique car shows. Seniors who need transportation can use the Ashtabula County Trans System or Richmond Transportation. The city also offers a door-to-door service to areas that aren’t accessible by the point deviation bus routes. Ashtabula is home to world-class medical facilities, including Ashtabula County Medical Center, in the event of medical emergencies or illness. Assisted Living costs in Ashtabula start around $3,627 per month on average, while the nationwide average cost of assisted living is $4,000 per month, according to the latest figures from Genworth’s Cost of Care Survey. It’s important to note that assisted living rates in Ashtabula and the surrounding suburbs can vary widely based on factors such as location, the level of care needed, apartment size and the types of amenities offered at each community. 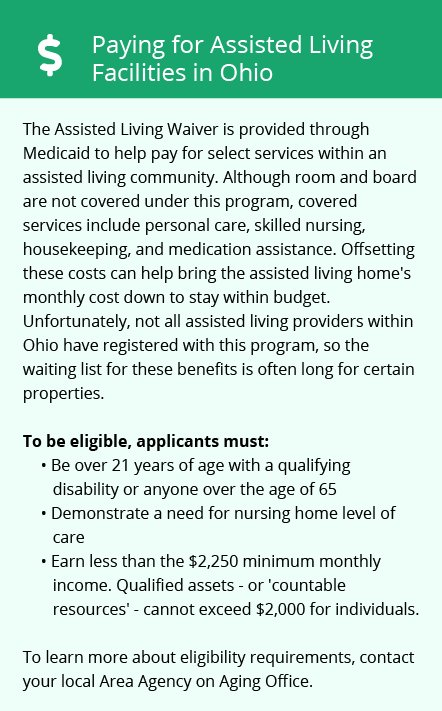 Ashtabula seniors who need monetary assistance paying for ALF might be able to take advantage of the Assisted Living Waiver Program (replaced with MyCare Ohio in some counties) and Ohio Residential State Supplement. Ashtabula and the surrounding area are home to numerous government agencies and non-profit organizations offering help for seniors searching for or currently residing in an assisted living community. These organizations can also provide assistance in a number of other eldercare services such as geriatric care management, elder law advice, estate planning, finding home care and health and wellness programs. To see a list of free assisted living resources in Ashtabula, please visit our Assisted Living in Ohio page. 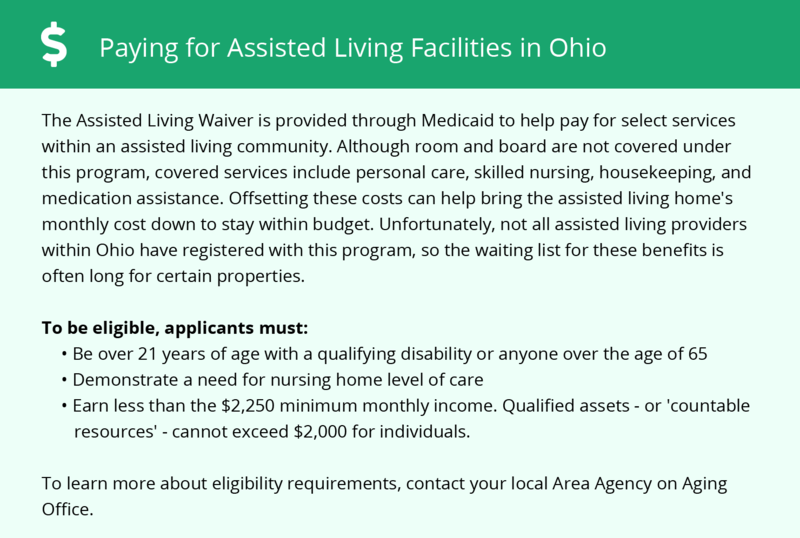 Ashtabula-area assisted living communities must adhere to the comprehensive set of state laws and regulations that all assisted living communities in Ohio are required to follow. Visit our Assisted Living in Ohio page for more information about these laws.